CHENNAI, Aug 4 2012 (IPS) - At 4:30 a.m. on the morning of Jul. 30, sleeping passengers in carriage S 11 on the Chennai-bound Tamilnadu Express were awoken by a blazing fire, as the train approached the east coast town of Nellore, just two and a half hours shy of its final destination. At least 32 people burned to death in the train, their bodies charred so badly that hospitals were forced to use DNA analysis to identify the victims for anxious families. Officials have not ruled out a short circuit in the train toilet or sabotage, considering one survivor reported hearing a loud bang in the burning train car. Whether or not gas cylinders or other inflammable materials were aboard the train is yet to be established by the Railway’s formal inquiry. For grieving family members, the inquiry might be too little too late. But if similar tragedies are to be avoided in the future, authorities must use this accident to draw lessons in disaster management for the colossal Indian railway network, which operates 9000 trains carrying 18 million passengers daily. This number does not include the countless thousands who travel on train roofs, undeterred by the risk of fatal injuries inside mountain tunnels or the possibility of electrocution. It quickly became apparent to disaster management experts, after the fire had been put out and the survivors pulled to safety, that the lack of emergency preparedness on most Indian trains is a huge liability. It was the gatekeeper of a railway crossing who first noticed the fire in the passing carriage and notified the Nellore railway station, which halted the train. By then screaming passengers had already pulled at the emergency brake. 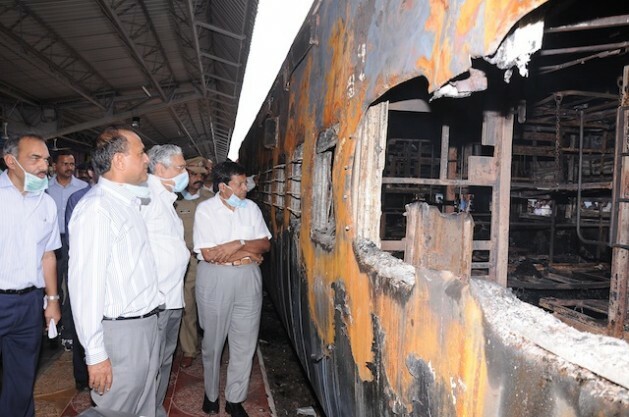 The burning car was immediately separated from the train to prevent the fire spreading to other coaches. But this did not make up for the fact that there were no fire alarms in the train cars. The public relations officer of the South Central Railway, Frederick Michael, confirmed to IPS that there were no fire hydrants in the sleeper car. “Since it was night time, the passengers had closed all the windows and one door of the vestibule that connects to the rear car was also locked for the night to prevent criminal elements’ entry and mischief,” he said. The other vestibule door, according to reliable sources, was also closed for the night, resulting in a death trap for the passengers. Inflammable material like synthetic cushion covers and curtains, inadequate emergency exits and fire extinguishers, to say nothing of a poorly trained cabin crew are the main culprits in this avoidable disaster, experts told IPS. Lower class train cars, which carry millions of Indians, do not contain a single fire extinguisher or hydrant. Nor are passengers instructed in basic emergency evacuation procedures. Further, there is no public address system on board the long-distance non-luxury trains. Railway coaches are in dire need of inflatable life rafts with a rigid hull, disaster management experts aver. These rafts should automatically unfurl themselves as escape chutes from the hinges of the emergency exits in case of a fire, or during a water evacuation. These can help save lives and can also double up as easy transport for frail, infirm and physically challenged passengers. Wide emergency exits with collapsible shutters that can automatically open during emergencies need to be installed by the dozen in every train car. Currently each car has only four emergency exits and four entry doors for carriages that accommodate 72 passengers and probably carry scores of other unreserved commuters. The spokesman of the Integral Coach Factory (ICF) in Chennai told IPS that ICF only manufactures coaches for Indian Railways but is not responsible for the design of the carriages, nor the rolling stock – hardware such as wheels, steps or sleeper frames – within them. The fact that the Railway Authority does not provide for the needs of physically challenged persons is hazardous to all passengers during emergencies and seriously hinders rescue operations – with the infirm or the disabled getting left behind, or other passengers stuck behind them. The average height of the train floor is at least 1.5 metres above the ground. The steps are arranged more like a ladder than a staircase, making it impossible for physically challenged passengers to use them unassisted. Though the mobile “medical relief van” stationed at all railway stations reached the burning train within minutes, they found they could not access the passengers inside, as the inflammable material and burning heat had caused the doors’ locks to melt and fuse together. Ambulances rushed the critically injured survivors to the district general hospital after rescue teams cut through the burning car. If the fire had occurred in the countryside it would have led to far more casualties, experts say. But these services should be the responsibility of the railway authorities. Emergency equipment should be installed in every railway station across the country as part of disaster mitigation efforts, especially since the railway network has been responsible for the deaths of 1,200 people in the last five years alone according to statistics provided by Indian Railways. Michael believes that “a review of design is urgently called for; hereafter we will have to heed attention to alternative designs.” Wide collapsible doors that automatically roll up in the event of fires are far more effective than doors that have to be opened manually. Locks and emergency brakes need to be automated to ensure heat does not create vacuum chambers and seal doors shut. If the Indian Railways fails to learn its lessons from tragedies like the one at Nellore, then it is condemning thousands of other passengers to a similar fate.